It’s a question Tina Packer hears all the time these days. After 32 seasons as Shakespeare & Company’s artistic director, chief prophet and all-around Visionary-in-Chief, Tina is changing titles and changing focus—from the day-to-day fire-extinguishing required at an organization of this size, over to its long-term plans… the Big Picture. “It’s not having to deal with the day-to-day ‘crises.’ I’ll have less things to deal with and more time to concentrate on the essentials,” she says, seated in her office in the Miller Building during a quick break in her schedule. She’ll also keep busy fundraising, working toward the goal of completing the Company’s $10 million Capital Campaign. There’s also a series of key infrastructure improvements around the S&Co. campus. And of course, furthering the plans to build a historically accurate Rose Theatre on the grounds here. It’s all part of the Company’s growth into an international center for all things Shakespeare. Tina can barely get a word out before her cell phone starts ringing. She turns it off, and continues on the topic of interruptions. Since June 1, Founding Company member Tony Simotes has been on board as full-time Artistic Director, with Tina switching to the title of Founding Artistic Director. Tony was one of the original group of theatrical renegades who trekked up to the Berkshires in 1978 and pursued the idea of a Shakespeare theatre company rooted in a personal connection to the text. One very practical impact of Tony’s arrival is that now Tina can finally get out of the office—literally. It’s not a good place to do any serious writing, for one thing—not with 250 people on staff in the high season, and seemingly all of them jousting for just a little bit of time. So her immediate plans include a slate of acting engagements outside the Company. After critically acclaimed turns as Queen Gertrude in the Company’s celebrated production of Hamlet (in 2006, followed by a national tour in 2008 and a highly anticipated remount this summer) and Cleopatra in S&Co.’s stunning and triumphant 2007 production of Antony and Cleopatra, Tina is hitting the boards again with a short run of Shirley Valentine, followed by Hamlet and then an engagement portraying Martha in Edward Albee’s Who’s Afraid of Virginia Woolf? at Boston’s Publick Theatre. At this point in a career that began with acting jobs in the Royal Shakespeare Company and national BBC programs, and includes a resume of having directed more Shakespeare than, we think, any other woman on earth, Tina is nervous about this next role. After Virginia Woolf, she travels back home to England to play Martha in Franz Xaver Kroetz’s Through the Leaves, at Colchester’s Mercury Theatre Company, a Company stocked with veterans from S&Co.’s Training Program. This will be the first time she’s performed onstage in Great Britain since she left and founded Shakespeare & Company. 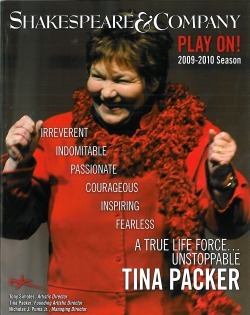 Tina feels she can relax a little, she says, because the influence of the Company’s actor training methodologies, developed and honed over the course of 32 years of intense workshops, heated arguments and passionate stage work, could be seen even in her last visit to New York, when she was casting for the 2009-2010 season. “Thirty years ago, you couldn’t understand anything anybody said. Actors jumbled up the text, the structure, they didn’t use the language. That’s all changed. Everybody knows now about structure, everyone knows that Shakespeare comes through the language. It’s terrific,” she says. Tina’s impact on the international Shakespeare community was most recently evidenced by her receipt of the American Shakespeare Center’s second-ever Burbage Award, for artists who have profoundly influenced the performance of Shakespeare in this country. And she just received an honorary doctorate—her sixth—from Lesley University, which cited her influence on the education system as well as theatre training. After over 30 years living in the United States, Tina became a U.S. citizen in 2007. She’s still competitive with the old country.